Streaming music such Spotify, Apple Music let's access to millions of songs easily today. With so much selections, you may feel confused which song to listen to. Fortunately Spotify offers lots of music discovery and sharing features to help us to find our favorite songs more easily. For instance, you can share files via Facebook, Twitter, Skype, Tumblr, Instagram and so on. Do you enjoy Spotify songs and have you found the best ways to share Spotify tracks? If you are still not so sure how does the sharing feature work, you can take a look at this page. We will show you all the details here. Depending on the devices you have, you can either share songs via your Windows/Mac computers or mobile devices such as iPhone, iPad, iPod Touch or Android phones. Also, you can make your songs public. Step 1. Launch Spotify from your computer and then sign in with the account name and password if you haven't done that yet. Step 2. Check and locate the playlist you want to share with others. You can pick up an album you want from the Spotify library or your own library. Also, you can simply structure a new playlist by right clicking on the sidebar under "Playlists" menu. Step 3. You can right click on the songs or playlists and then choose "Share" menu. Step 4. It will pop up the option to share via social media or copy playlist link, embed code, Spotify URI to send via email, share online and so on. Just pick up the option you want and then follow the screen instruction to send it. Similarly, you can share Spotify songs just like what you do on desktop computers. In addition, there is a better way to share with the Spotify code. This is a unique tag to mark every song, album and playlist. The instruction is same across the iOS and Android devices. Step 1. Launch Spotify app on your phone and open the playlist you want. Step 2. Tap the 3-dot ion and find the code underneath the cover art. Step 3. Tap the artwork and choose "SAVE TO PHOTOS", you can send it to your friend. Step 4. Your friend who receive the code can simply click the search icon and tap the camera icon to start to scan the code to listen to it. All the playlists created by yourself will be marked as private by default. If you just want your songs viewable by others besides your friends, you can right click on the list and then click "Make Public" menu to make your music public to anyone. In addition, if you want others to add news songs to it, you can also click "Collaborative Playlist" to authorize others to edit it. 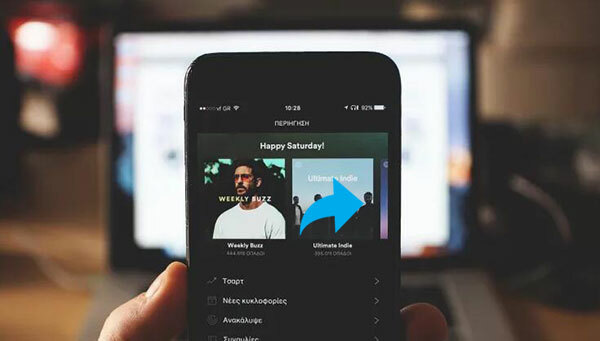 With the methods above, users who received the shared playlists will have to have Spotify accounts to enjoy the songs online. This is not so convenient sometimes considering that not everyone is a subscription member of Spotify. Is there another way to download the Spotify tracks so that we can access and share them without any limitations? Sure. You can use free streaming recorders online or professional Spotify recorders to record the music offline. But if you cares about the output quality and converting very much, I will highly recommend. DRmare Spotify Playlist Recorder for Mac/Windows. 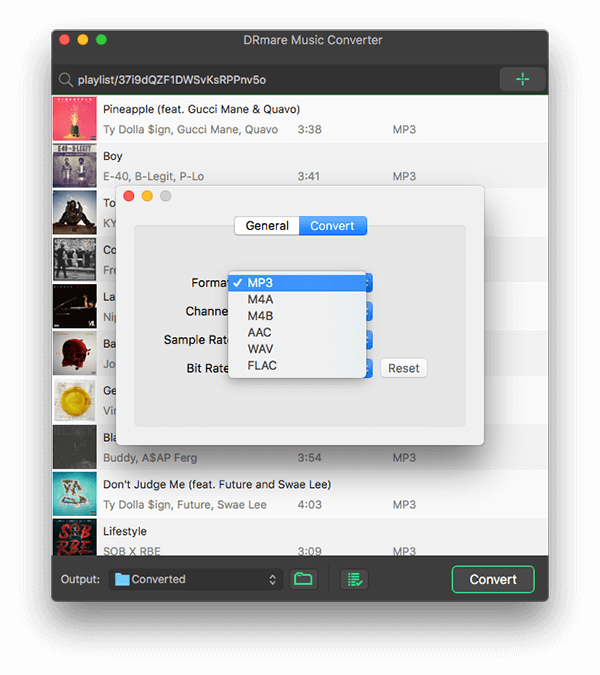 Unlike the free tools which takes real time and the output quality will be reduced, it can automatically import hundreds of songs and remove DRM protection from the Spotify tracks with 100% original quality, meta data such as album cover, title, artist and so on. The single license costs $19.95 while the family license costs $39.95. But it has lifetime free update, technical support. That is not bad if you are a longtime listener of Spotify music. Anyway, you can try it out for free either on Windows PC or Mac computers. The software comes with clean interface with optimized design. Anyone who have no technical knowledge will be able to use it without problems. Also, it has passed the international software standard after thousands of test, it won't have any compatibility problems in general. 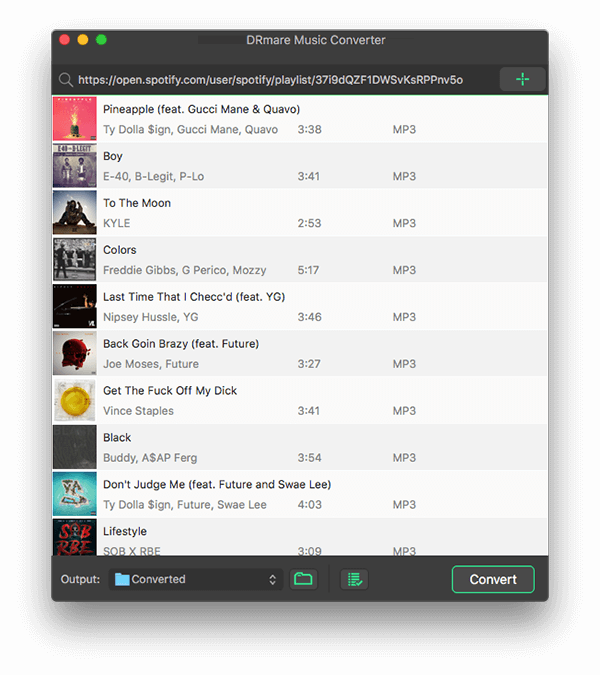 DRmare program is designed to extract Spotify songs online. All you need to do is to let the software know what files you want to convert. You can either copy the link of the songs or simply drag the playlists, artists to the main screen of the software. MP3 is a most widely supported audio format. It can maintain the best sound quality while keeping the size as small as possible. Here I will choose MP3. Of course, other formats such as M4A etc. are ok too. You may pick up the one according to your requirements and preferences. Finally, you just need to click "Convert" button from the bottom right and wait some time for it to process the tracks. 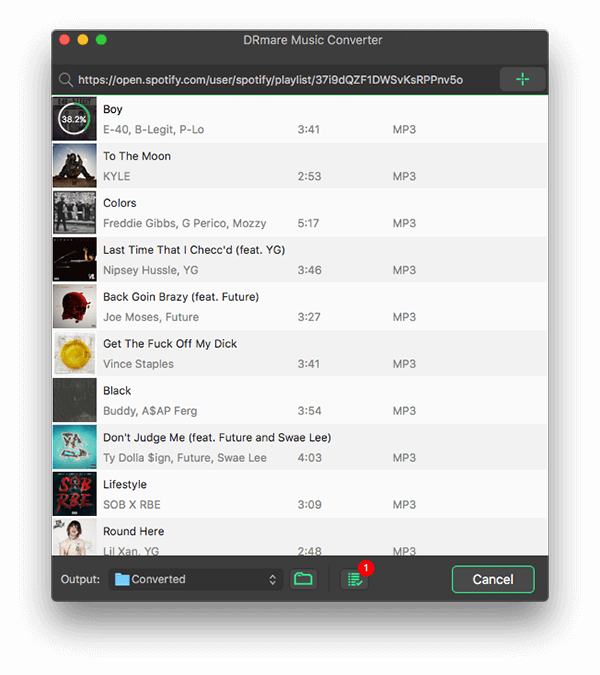 When it is done, you have more options to share your Spotify songs such as copying them to USB, burning Spotify to CD or attach the converted MP3 files by email. 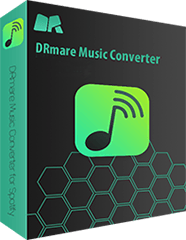 To find out how does it work by using a third party DRmare Spotify Music Downloader in an easier way, you can also visit this video tutorial directly. Sharing makes us happy. Nothing is better than enjoy the same songs with our best friends. But which way you should choose? In my opinion, if all of your friends are users of Spotify music, the official ways will be good. You won't have problem to share the Spotify tracks and playlists with them. Else if you have plenty of friends who haven't subscribed to Spotify, you'd better use a special Spotify converter to download the songs offline so that any of your friends or family people can play the music freely. The software price is $19.95 which is not high considering that it is a lifetime license with 24/7 technical support. What do you think? If you have any questions or recommendations, please feel free to let's know on the comment section below.